ADALGOTT, a monk at Einsiedeln Abbey (Kloster Einsiedeln) in the present-day Swiss Canton of Schwyz. In 1012, he was chosen to serve as Abbot of Disentis Abbey (Reichskloster Disentis) in the present-day Swiss Canton of Graubünden (Grisons). St. Adalgott reposed at Disentis in 1031. ALANUS and ALORUS, fifth century Bishops of Quimper in Brittany. Beyond their popular cult and Liturgical commemoration there is no information on their lives extant. ALBINUS (WITTA), one of the group that went with St. Boniface (5th June) to enlighten the peoples of Hesse and Thuringia. In 741 St. Alninus was consecrated Bishop of Büraburg in Hesse and served that See until his repose circa 760. ALFRED (ÆLFRED) the GREAT, The holy and right-believing King Alfred the Great was King of the West Saxons and of the Anglo-Saxons. He defeated the Danish invaders and ensured the growth of the Church in England. During peacetime King St. Alfred worked to revive scholarship in the kingdom. Motivated by a lack of books in English, the language he believed primary instruction should be conducted in, King St. Alfred and his scholars undertook the translation into English of those books he deemed "most necessary for all men to know". King St. Alfred’s personal contribution to this undertaking included translations of Pope St. Gregory the Dialogist's (3rd September) Pastoral Care , and Dialogues , Boethius's Consolation of Philosophy , and St. Augustine's (28th August) Soliloquies , and the first fifty psalms of the Psalter . He is the only English monarch to be called "the Great", and is greatly venerated by many as a patriot and archetype of Christian monarchy. King St. Alfred the Great reposed in 899. ANEURIN (GILDAS) and GWINOC, St. Aneurin and his son St. Gwinoc were Welsh monks. St. Gwinoc was the author of several Celtic poems, and churches at Aberhafesp, and Llanwnog (both in Powys, Wales) are dedicated to him. BEAN (BEÓZÁN, BEANUS, BEOANUS, BEYN) of MORTLACH, St. Bean was the first recorded Bishop of Mortlach in Banff, Aberdeenshire, Scotland. Nothing more is known of St. Bean’s life, other than that he reposed relatively soon after his consecration to the Episcopate, circa 1012. CEDD, St. Cedd was the brother of St. Chad of Lichfield (2nd March), and a monk at Lindisfarne. He laboured for many years enlightening the inhabitants of Leicestershire, and parts of Lincolnshire and Derbyshire. King Oswiu of Northumbria, sent St. Cedd south to serve as Bishop of the East Saxons at the request of their king. During his episcopate, St. Cedd actively founded churches throughout his See as well as monasteries in Tilbury and Lastingham. It is believed St. Cedd succumbed to the plague, reposing 26th October circa 664. His feast was originally kept on 7th January, though in the old English Breviaries he had a special Office which was usually said on 2nd March. On the contemporary calendars of the Moscow Patriarchate, the Archdiocese of Thyateira and Great Britain (Œcumenical Patriarchate), and the Orthodox Church in America St. Cedd is still commemorated on 7th January. CUTHBERT, St. Cuthbert succeeded St. Nothelm (17th October) as the eleventh Archbishop of Canterbury in 740. The earliest extant records identify St. Cuthburt as Abbot of Lyminge Abbey, in south-east Kent, and it is widely thought that St. Cuthbert was elevated to the See of Hereford circa 736. However, this is dependent upon the works of Florence of Worcester (†1118), and other post-conquest writers. The only contemporary record is in the Anglo-Saxon Chronicle , which states that St. Cuthbert was consecrated Archbishop of Canterbury in 740. Had he been Bishop of Hereford at the time he was elevated to the See of Canterbury, he would have been translated, as he already possessed the episcopal state. Due to the significant amount of time between the events and the post-conquest chronicling, it cannot be definitively stated St. Cuthbert was Bishop of Hereford prior to his elevation to Canterbury, however likely it might be. 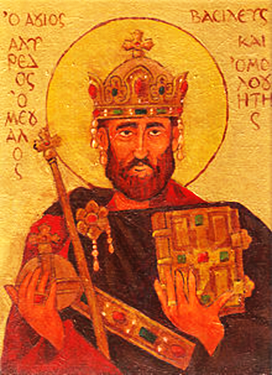 In 747, St. Cuthbert, along with King Æthelbald of Mercia presided over the second Council of Clovesho. Which, although primarily called as required by the seventh canon of the Synod of Herford, addressed several issues confronting the Church at the time. Not the least of which was the behaviour of the clergy, and excessive consumption of alcohol by the bishops; which had even prompted letters of complaint from St. Boniface (5th June), not just to St. Cuthbert and King Æthelbald, but to the Holy See as well. It is believed that St. Cuthbert obtained Papal permission for the, previously forbidden, practice of interring the dead within the walls of cities. He then mandated burial in churchyards and had the Chapel of St. John the Baptist (which unfortunately was destroyed by fire in 1067) built on the west side of Canterbury Cathedral. Though generally used as a baptistery, it was designed to be the burial place for not only himself, but also future Archbishops. St. Cuthbert reposed 26th October, 760, and was the first Archbishop of Canterbury to be buried in his own Cathedral, not in St. Augustine’s Abbey. EATA, a disciple of St. Aidan (31st August) from his youth, St. Eata received monastic tonsure at Lindisfarne. He was amongst the twelve monks selected to found a dependent monastery at Melrose in Roxburghshire, circa 651 serving as Abbot. Approximately seven years later St. Eata left Melrose, along with St. Cuthbert (20th March) and others and founded a monastery at Ripon in Yorkshire. St. Eata served there as Abbot until 661, when he returned to Melrose. Following the Synod of Whitby in 664 St. Eata was appointed Abbot of Lindisfarne, and in 678 he was consecrated Bishop of Lindisfarne as well. In 684, St. Eata was translated to the new Diocese of Hexham, serving as its first Bishop for the remaining two years of his life. St. Eata reposed in 686 following a bout of dysentery and was buried at Hexham Abbey. There is one church dedicated to him in England, at Atcham in Shropshire. EDFRID (EADFRID), according to the English Menology , St. Edfrid was a Northumbrian priest who, while visiting Mercia, converted Merewalh, (a sub-King of the Magonsæte) and preached the Gospel to his subjects. St. Edfrid is also believed to have founded Leominster Abbey at Hereford, Herefordshire, England. He reposed circa 675. EVARISTUS, the fifth Pope of Rome from circa 96, until he was martyred circa 105. GAUDIOSUS of SALERNO, there are no extant details of St. Gaudiosus’ life, it seems he was Bishop of Salerno in the mid-seventh century. His relics are enshrined in Naples. GIBITRUDIS, a nun at the double Abbey of Our Lady of Faremoutiers-en-Brie, where she was a disciple of the foundress St. Burgundofara (3rd April). St. Gibitrudis reposed circa 655. Nothing further is known of her life. HUMBERT, a monk at the Abbey of St. Peter at Fritzlar, (24 km / 15 mi south-west of Kassel) in the present-day German state of Hesse. St. Humbert was later chosen to serve as Prior of Büraburg, most-likely serving from circa 723 until his repose circa 741. QUADRAGESIMUS, Pope St. Gregory the Dialogist (3rd September) lauded the holiness of this shepherd and (sub)deacon in Policastro in Campania. According to St. Gregory, St. Quadragesimus raised a man from the dead. St. Quadragesimus reposed circa 590. 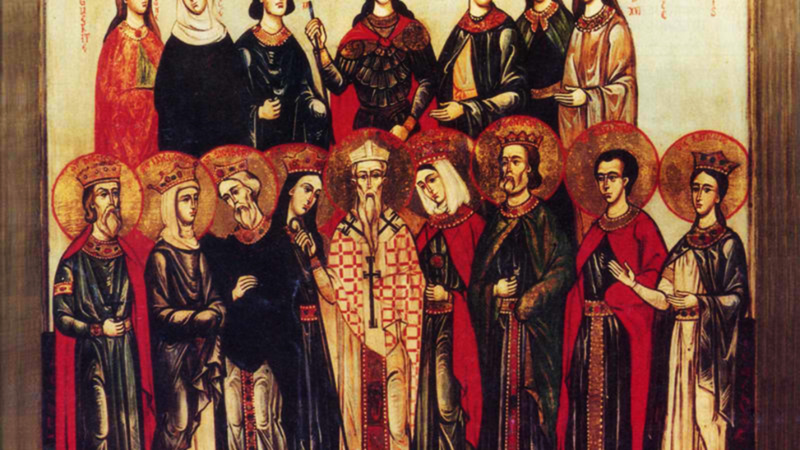 ROGATIAN and FELICISSIMUS, Rogatian, a priest, and Felicissimus, a layman, of the church of Carthage were martyred in 256, during the early part of the Valerian Persecution. In his Epistle to Christian Prisoners St. Cyprian (16th September) encourages prisoners to follow the example of these saints, as St. Cyprian did, not two years later. RUSTICUS, fifth Bishop of Narbonne, the dates of his episcopacy vary with the source, however, Roman Catholic Priest and Critical Historian Louis Duchesne (†1922), gives the dates 427–circa 457, which are most likely the most accurate. Upon completion of his education, St. Rusticus spent time in Rome, then on the advice of St. Jerome (30th September) St. Rusticus entered the Abbey of Our Lady of Lérins where he was ordained to the priesthood, and in 427 consecrated Bishop of Narbonne. 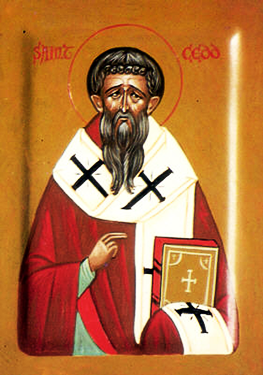 Whist bishop, St. Rusticus attended the Third Œcumenical Council at Ephesus in 431. During his episcopacy, St. Rusticus had to contend with the spread of the Arian heresy (there has even been speculation that he had to contend with an Arian bishop claiming his See). This combined with the Siege of Narbonne by the Goths and dissention amongst his flock so disheartened St. Rusticus that he wrote Pope St. Leo the Great (10th November) expressing his desire to resign his See, though St. Leo convinced him to persevere. St. Rusticus then set about reconciling the Christian community of his See, built the Church of St. Genesius of Arles, now the Cathedral of Saints Justus and Pastor of Narbonne (Cathédrale Saint-Just-et-Saint-Pasteur de Narbonne), attended the Council of Arles in 435, and fought against Nestorianism. St. Rusticus reposed circa 457–462. SIGIBALD, thirty-eighth Bishop of Metz serving from 716 until his repose circa 740. His episcopacy is especially remembered for the several monasteries he had built, including St Nabor Abbey, the present-day the Abbey-church Saint-Nabor, in Saint-Avold, Moselle in north-eastern France.